Canned, dry, home cooked or raw meat; our nutritional experts make feeding your dog safer and easier. Does your dog eat dirt, poop, or grass? He needs the probiotics that ii Carnivores naturally obtain from the digestive tract of their prey, not from dog food. Dogs don't get natural probiotics in their sanitized commercial diet, although some premium dog food makers are now including these critical nutrients. L. acidophilus is the most common probiotic, otherwise known as "good" bacteria. In addition to probiotics, wise dog owners also provide prebiotics which help probiotics thrive in the intestine. Find Instant Information on ii The Carnivores Diet. An easy, practical and economical way to boost your pet’s over-sterilized digestive system is to offer yogurt or buttermilk, both of which are fermented. Fermented foods are the natural result of pre-bacteria feeding on the sugar and starch in the food which then creates beneficial enzymes, b-vitamins, Omega-3 fatty acids, and various strains of probiotics. Natural fermentation of foods helps to preserve nutrients while breaking it down into a more digestible form. Probiotics are also found in fermented foods like sauerkraut but your dog isn’t going to eat sour stuff! While yogurt does contain some sugar, Greek yogurt uses lactose, the kind of sugar found in milk. Most dogs love Greek yogurt so get the unflavored variety. 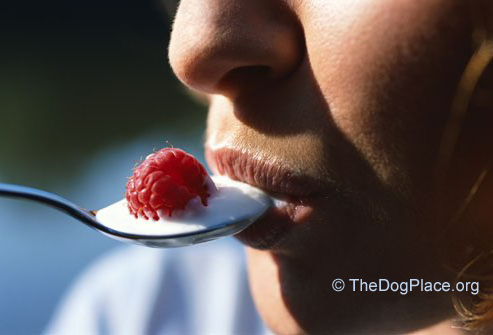 Flavored yogurt contains sugar which causes inflammation and certainly your dog does not need that! Neither do you so buy the Greek yogurt and add your own fresh fruit or fruit jam. Other Probiotics that your dog will relish are lightly boiled or stir fried onion, garlic, carrots and dandelion greens. Save some for yourself because a good balance of gut bacteria and digestive enzymes helps you absorb more of the live nutrients in the foods you eat. 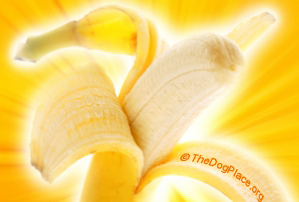 Another food dogs like and which will help their intake of prebiotics and probiotics is the readily available, inexpensive banana[Ref 1 - Mood Food display below]. Dogs will also eat cooked asparagus and tomatoes. I know prebiotics are found in whole grains but I don't know a single dog that would naturally eat corn! In a kennel situation where the dogs rarely get fresh meat and veggies, owners report obsessive stool-eating. It is not just frustrated boredom, coprophagia it is always prompted by dietary deprivation. Remember your dog descended from the wolf. Wolves can derive nourishment from an old bone or piece of caribou hide your toy poodle would only play with. 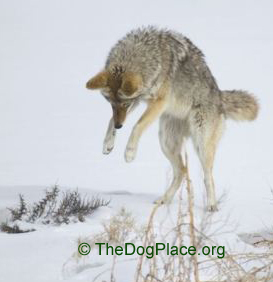 Wild canines have a multitude of probiotics which improve digestion. That gives you good reason to seek a source for raw beef bones and if possible, organ meats. Most “grocery store” meat comes pre-packed with bones and trimmings and the “good stuff” is sold for the pet food market. You may have to seek a slaughter house or butcher in your area. Why not just get ii probiotics from supplements? Well you can but there are some caveats. There is no set amount on what a daily dose of probiotics for you or your dog should be but a happy target is at least 1 billion. 10 times that much is ten times better… Results can be amazing, and noticeable within a few days! You won’t need as many supplements and vitamins, bloat will disappear and your tummy will thank you. 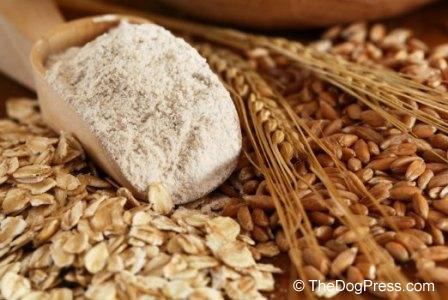 Do you know what "denatured" ingredients in pet food are and why you NEED to know? Here's Instant Information on ii Denatured Ingredient in pet food.. Dogs like bananas! 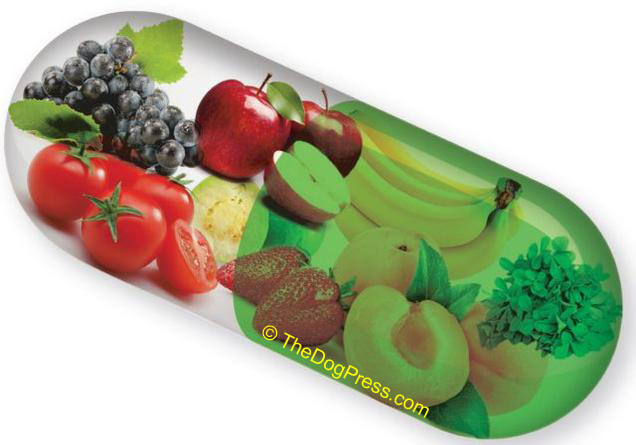 Good for a dog's healthy brain and yours! Deadly if not stopped quickly, over-the-counter product that works!